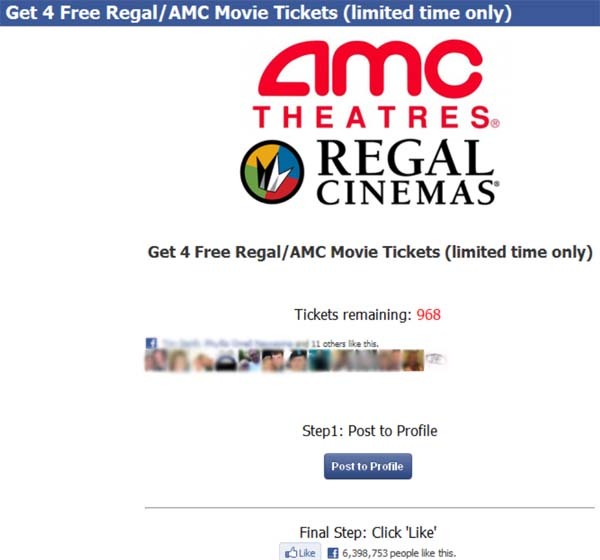 We are giving away 4 Free Regal or AMC movie Tickets to all facebook users! 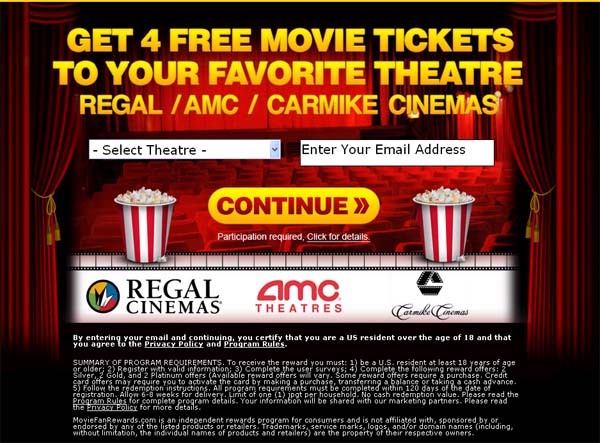 By reading the Terms and Conditions of the ‘deal,’ you quickly discover that you have to complete a total of 6reward offers. These offers often cost money. You also have to complete surveys – keep in mind that your personal data will be shared with other marketers, sponsors, scammers – whatever you want to to call them! You are usually required to provide your name, address, phone numbers and date of birth. This will enable the shady marketers to not only spam your Facebook account, but also harass you via snail mail, phone calls and text messages. Be extra suspicious of free offers or anything that sounds too good to be true. For more information on Facebook scams related to free offers, please see our alert: Beware of Facebook Freebies! Previous post FREE $500 H&M Gift Card (LIMITED TIME ONLY) - Facebook Scam Next post Your Privacy is at Risk - Help Defeat CISPA!